Senior quarterback Jay Foley (left, with the football) will lead Haddonfield against St. Joseph in a clash of the No. 3 and No. 1 teams in the rankings. No. 5 St. Augustine (2-2) at No. 19 Ocean City (3-0), 7: The Hermits are coming off an impressive victory over Shawnee and are looking to secure themselves a No. 6 or 7 seed in the Non-Public 4 playoffs, which would mean a first-round home game. Senior linebacker Joe Bonczek leads St. Augustine’s defense. St. Augustine has a sturdy defense led by senior LBs Joe Bonczek and Shane Quast and a playmaker on the outside in senior Jaylen DeCoteau, who has caught a TD pass in each of the last two games. Senior QB Ian Aungst has led Ocean City to a 3-0 start for the first time since 2000. 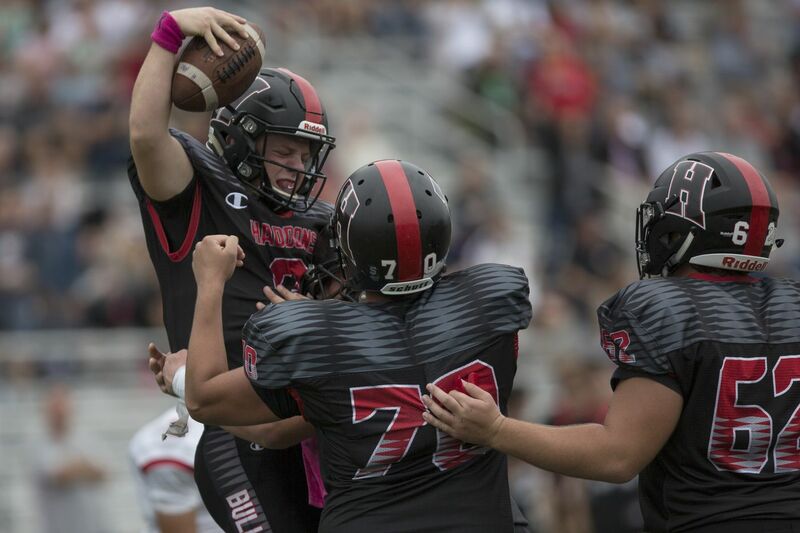 A victory over St. Augustine would be a huge statement for the Red Raiders, who have quietly re-emerged as a highly competitive program over the last few seasons. Ocean City is 15-4 in its last 19 games. Cherokee (0-3) at Millville (1-3), 6: Things don't get any easier for the Chiefs and first-year coach Brian Glatz. They get the resurgent Thunderbolts this week followed by No. 2 Williamstown and then No. 5 St. Augustine. Cherokee has some playmakers in juniors E.J. Bard, who ran for 102 yards and a TD in a loss to Rancocas Valley, and Jackson McIntyre, who caught nine passes for 106 yards vs. the Red Devils. Millville might have played South Jersey's toughest schedule in the first three weeks, losing to North Jersey non-public superpower St. Peter's Prep as well as South Jersey No. 1 St. Joseph and No. 2 Williamstown. The Thunderbolts got in the win column last week vs. Kingsway and will look to keep the momentum going. Senior QB Eddie Jamison threw three TD passes vs. the Dragons. No. 14 Highland (4-0) at No. 7 Timber Creek (2-1), 7: This is a big game between Black Horse Pike school district rivals. Timber Creek is an established power. Highland is a team on the rise. That context makes for a classic matchup between champ and challenger. Highland was hugely impressive in a 30-20 win over then-No. 17 Winslow Twp. Sophomore RB Johnny Martin ran for 240 yards and three TDs, and senior ends Dahmir Barefield and Javon Randall led a spirited defensive effort. The Tartans are 4-0 for the first time since 1989. Timber Creek got off slowly with a big loss in Ohio and also had an early bye week, so the Chargers are still finding their footing. They scored an impressive win at Vineland on Friday, as junior Tarheeb Still, a playmaker to watch, snatched two interceptions. Moorestown (0-3) at Shawnee (1-2), 7: Both these teams likely will be desperate to get their seasons back on track. Shawnee has dropped two straight after a season-opening win vs. Cherokee. The Renegades can get to .500 and start working their way back into South 4 playoff contention with a victory over the Quakers. Senior Joe Dalsey, a top runner, passer and kicker, has led the way for Shawnee. Moorestown has played a tough schedule, but the Quakers need to find a way to win. One year after going 9-2, they will be hard-pressed to return to the state tournament if they fall to 0-4. Seniors Nick Cartwright-Atkins and Brian McMonagle lead Moorestown, which can revitalize its season with victories over Shawnee and Highland in the next two weeks. No. 9 Burlington Twp. (3-0) at Delsea (1-2), 7: The host Crusaders, the defending South Jersey Group 3 champions and winners of five of the last six sectional titles, have struggled against West Deptford and Camden the last two weeks. Delsea has a chance to get to .500 and turn things around with an upset of the Falcons. Senior lineman Colin Poisker is a top player for the Crusaders, who likely will look to hug the ground and play a physical style against the high-flying Falcons. Burlington Twp. has been impressive with an explosive offense led by senior QB Dan Grozozski, who has eight touchdown passes. The Falcons have playmakers to watch in seniors Omar Rogers, Justin Johnson and Tyrese Ware. Pennsauken (3-1) at Kingsway (2-2), 7: This is a key game for both teams. The winner will emerge with momentum, much better playoff positioning, and cause to regard itself as a legit team to watch this season. Kingsway is coming off a tough loss to No. 22 Millville. The Dragons' other loss was to No. 14 Highland, so they've been tested in a challenging schedule. Pennsauken junior running back Nahzir Russell (left) takes a kickoff at practice. Junior all-purpose standout Alex Odom is a player to watch for Kingsway. Pennsauken had one slip against rival Cherry Hill West, which emerged as the No. 24 team in the rankings this week. Otherwise, the Indians have taken care of business against three winless teams. But this is a chance for the Indians to take a step up with a victory over a competitive Group 5 opponent. Senior Nahzir Russell has led the way for Pennsauken. He scored three TDs in a shutout Saturday of Cherry Hill East. Eastern senior Andrew Heck threw five touchdown passes vs. Washington Twp. Paul VI (0-4) at No. 18 Eastern (2-1), 7: The host Vikings are coming off a big win over Washington Twp. as senior Andrew Heck threw five TD passes. This game has extra meaning for Eastern coach John Doherty, who spent 13 seasons at Paul VI. Doherty turned the Eagles into a South Jersey power before resigning after the 2015 season. Doherty coached current Paul VI coach Glenn Hutton as well as most of the Paul VI upperclassmen. Paul VI's first three losses were to teams in the Top 25 at the time, and the Eagles also have lost to Clearview, a team hovering on the outside of the rankings. Paul VI might have South Jersey's top kicker in senior Henry Westermann, who recently made a 52-yard field goal. Cherry Hill East visits Princeton in a key clash for the Cougars. Cherry Hill East (0-3) at Princeton (0-3), 11: Something has to give when these teams get together. Princeton has lost 21 in a row. The Little Tigers have been shut out in their last five games. They've been outscored 149-0 this season. Cherry Hill East has lost 31 games in a row in a streak dating to a 21-20 win over Northern Burlington on Sept. 19, 2015. Under first-year coach Andrew Daley, the Cougars were competitive in a season-opening loss to Triton, then struggled a bit vs. current or former Top 25 teams Eastern and Pennsauken. Senior DB/WR Isaac Jean-Baptiste is a player to watch for CHE. With Cumberland, Egg Harbor and Seneca next on the schedule, Cherry Hill East could see its way to playing some competitive games in the next few weeks, especially if the Cougars can break the three-years-and-counting losing skid vs. Princeton. St. Joseph junior Jada Byers has drawn comparisons to former Paulsboro star Kevin Harvey. No. 3 Haddonfield (4-0) at No. 1 St. Joseph (4-0), noon: This is the Game of the Week, a fascinating clash of the non-public-power Wildcats and the Group 2-power Bulldawgs. This teams both are defending champions. St. Joseph won the Non-Public 2 title last year, the Wildcats' eighth state crown in the last nine years. Haddonfield won the South Jersey Group 2 title last year, the Bulldawgs' fourth sectional crown since 2010. This is first time the teams have met on the football field, per research by South Jersey sports historian Chuck Langerman. St. Joseph has perhaps South Jersey's top offensive line, led by seniors such as Wisdom Quarshie, a Temple recruit, and Brad Lomax. The Wildcats' top playmaker is dynamic junior Jada Byers, who has been reminding some observers of former Paulsboro star Kevin Harvey. Haddonfield is a balanced, confident, experienced team. The Bulldawgs have a playmaker at quarterback in senior Jay Foley, who threw four TD passes in a win over Overbrook. Senior all-purpose Davis Smith caught two of them. Haddonfield's defense has been air-tight, allowing just 14 points all season, with two consecutive shutouts heading into this showdown at St. Joseph's Bill Bendig Field. No. 15 Pleasantville (3-1) at No. 20 Cedar Creek (2-2), 1: This is an interesting clash between local rivals looking to secure their positioning for the South 2 playoffs. Pleasantville is led by Rutgers recruit Mohamed Toure, a running back and linebacker. After a competitive loss to No. 3 Haddonfield in the opener, the Greyhounds have outscored their next three opponents by a combined 157-6. Cedar Creek is one of many teams in the WJFL feeling the brunt of a schedule shift that challenges teams that have been successful in recent seasons. The Pirates are battle-tested, with losses to Top 10 teams Camden and Woodrow Wilson. Junior all-purpose Malachi Melton and senior running back Kamaal Reed are among the players to watch for Cedar Creek.